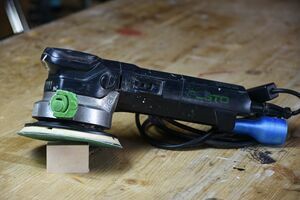 An eccentric sander is very useful for finishing surfaces. 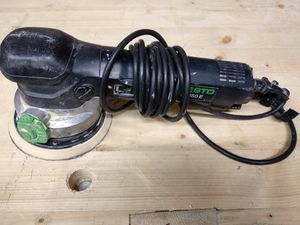 The major advantage of this kind of sander is the irregular motion of the sanding disc which greatly reduces unsightly marks on the workpiece. When using an eccentric sander, always take the time to properly clamp down your workpiece, hook up the shop vac and wear safety glasses. Depending on your material, you may also need a dust mask. As with all our sanders, please go outside if you can't keep the airborne dust to a minimum! The Festo RO 2 E had a broken switch when we got it, we overrode that and installed a cord switch instead. That means it has no protection against accidental turning on after you plug it in (keine Anlaufsicherung)! When the foam part of our usual sanding part crumbled away, Keno and Lukas attempted to glue its velcro (Klett) sheet to a healthier pad with bad velcro ("Polymer-Klebstoff", results pending). The Festo RO 150 E needs to be repaired (see #25) before it can be added to the wood workshop. Since the other one is working, this is not overly urgent though.